The efficacy of the influenza vaccination exceeds 80% in healthy people aged <65 years, when there is a good match between the vaccine strain and the circulating strain of the influenza virus.3 Although the vaccine is not as effective in patients aged >65 years, it has been shown to significantly reduce severe complications and mortality in this patient population. For the 2014-2015 season, the Advisory Committee on Immunization Practices recommended that all persons aged ≥6 months receive the vaccine unless contraindications were present.4 Since 2010, the US Department of Health & Human Services has established influenza vaccination goals within the Healthy People 2020 initiative. The objective of this initiative is to increase immunization rates and reduce preventable diseases.5 A target vaccination rate of 80% has been set for noninstitutionalized adults aged 18 to 64 years by the year 2020; this goal far exceeds the baseline of 24.9% assessed in 2008. As we, as a nation, aim to reach our Healthy People 2020 influenza vaccination goal, it is essential that we continue to research and identify barriers, and develop strategies to address them. Although it is challenging to identify an individual’s personal barriers, any information yielded from research on this subject could prove vital to helping our nation achieve its goal. Based on trends seen firsthand, we believe that some of the barriers to vaccination could be related to cost, access to the vaccine, or myths surrounding the virus or vaccine. 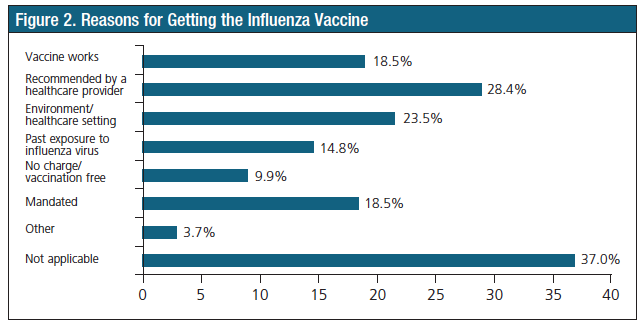 To identify strategies to increase influenza immunization and better understand barriers to vac­cination, we surveyed patients regarding the reasons for and against receiving the vaccination. The survey consisted of 15 questions compiled from trends we observed in our practice. Of these questions, 5 sought patient demographics and 10 were opinion-based (Figure 1). After receiving Institutional Review Board approval, surveys were sent to various participants (>18 years) chosen randomly based on patient availability within different local communities. Each participant was provided a survey via an electronic link in an email, or as hard copy. By participating in the study, respondents provided implied or verbal consent. No personal information was retrieved from participants during the study. E-mails were sent to various colleagues to determine what they perceived as barriers, and individuals from local churches with strong community involvement with the request that they forward the e-mail or hard-copy survey to other indi­viduals for completion. Respondents who completed hard-copy surveys were solicited at local retail pharmacies in various communities randomly without regard to specific dates and times. Completed hard-copy surveys were collected immediately or at a later date. All hard-copy surveys were then converted into an electronic format for use in the KwikSurveys database. Results were then condensed for evaluation. A total of 81 participants responded from various states, including Texas, Arkansas, Tennessee, Florida, Alabama, and New Jersey. Of the 81 participants, 58 were women, and 23 were men (Table). Approximately, 67.1% self-identified as African American and 23.3% self-identified as Caucasian. In addition, 45.1% reported that their highest level of educational attainment was a high school diploma and 19.5%, an associate’s degree. Among the participants who completed the survey, 72% believed that the influenza vaccine is effective in preventing the flu virus. Twenty-eight percent did not believe the vaccine is effective. On the other hand, when asked whether the vaccine increases a person’s risk for the flu, 32.9% agreed and 67.1% disagreed. More than 55% of participants reported that they received the influenza vaccine during the 2013-2014 flu season, whereas 45% responded that they had not. Twenty-one percent of those who received the vaccine received it from a medical clinic, and 18.5% received it from a pharmacist. When asked to select from the following possible reasons for why they chose to receive the vaccine, 28.4% of the patients reported following the recommendation of a healthcare professional (Figure 2). Eighteen and one-half percent reported believing that the vaccine is effective; this group of patients also reported living and working in an environment that increases their risk for acquiring the virus. Of the possible reasons listed that may have prevented a participant from receiving the vaccine, never having the virus was reported by 13.8% of study participants as the reason they chose not to receive the vaccine (Figure 3). Lastly, survey results indicated that >71% would obtain the vaccine if it were recommended by a healthcare professional. Interestingly, 64.2% of study participants reported believing that if they got the flu, it could have serious consequences, including death. We sought to determine possible barriers to influenza vaccination, and were surprised to find that these barriers went beyond access, cost, and misconceptions. The study also demonstrated that the barriers were associated with health literacy, lack of recommendations from providers, and lack of patient understanding regarding the severity of influenza. 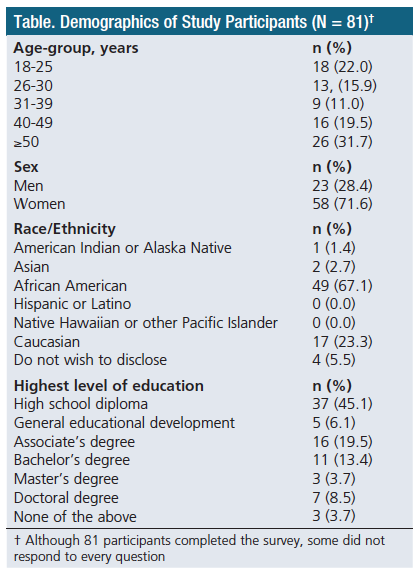 Approximately 67.1% of study participants were African American, and 45.1% had a high school diploma (Table). Literacy and health literacy have been areas of needed improvement among minority communities for many years. Title V of the Patient Protection and Affordable Care Act defines health literacy as the degree to which an individual has the capacity to obtain, communicate, process, and understand basic health information and services to make appropriate health decisions.10 Results from the last National Assessments of Adult Literacy (NAAL) health literacy component in 2003 revealed that 58% of Caucasian adults had inter­mediate health literacy, compared with 41% and 31% of African American and Hispanic adults, respectively.11 In addition, the data indicated that 19% of Caucasian adults had basic health literacy compared with 34% and 25% of African American and Hispanic adults, respectively. Lastly, 9% of Caucasian adults were below basic health literacy, whereas 24% and 41% of African American and Hispanic adults, respectively, were at that level. We also found that 64.2% of participants did not believe that the influenza virus could be fatal. Data from the study suggest that participants do not understand the consequences that can occur if they acquire the virus. Although 72% of participants reported believing the vaccine is effective, many did not understand the severity of the virus, and, therefore, did not feel the need to receive it. The NAAL health literacy component suggests that adults with below basic or basic health literacy are less likely than adults with higher health literacy to get information about health issues from written sources (newspapers, magazines, books, brochures, or the Internet), and more likely than adults with higher health literacy receive information about health issues from radio and television broadcasts.10 As America continues to work on improving health literacy, additional steps can be taken to alleviate barriers and increase influenza vaccination rates. Low literacy and health literature quickly became evident during the course of the study. A large percentage of completed surveys were obtained in person at a local retail pharmacy. When individuals were asked to participate, many said no despite the fact that they were waiting in the pharmacy area for prescriptions. It was quickly determined that many individuals’ reluctance to participate was associated with their inability to read; this was not an initial barrier we suspected. However, to address this issue, participants were offered assistance with completing the survey. Many agreed to participate in the survey with the assistance provided, which included reading the question and answer selections slowly and clearly. In addition, any words or terms that may have caused confusion were defined for the patient. This should be taken into consideration in future studies. In addition, although this study sought to evaluate barriers to influenza vaccination among a random group of patients in the community, an overwhelming majority of the participants were African American and did not represent the diverse ethnic makeup of the American population. The study period was also short, spanning approximately 2 months, and did not yield the desired amount of surveys completed for data collection. We were also unable to track the number of surveys distributed, because we relied on word of mouth and organizations with large community involvement. Lastly, hard-copy data collection was transposed to electronic format by hand, which has the potential for human error. Healthcare professionals are encouraged to convey the benefits of obtaining the influenza vaccination to patients and members of their community. It has often been concluded that lower influenza vaccination rates may be attributed to the availability and cost of influenza vaccines, personal beliefs, and influenza myths. Although this study did not specifically narrow down the exact barrier, it did yield pertinent information to help address the issue. This study showed that although many individuals believe in the overall effectiveness of the influenza vaccine, many patients do not understand the risks associated with not getting vaccinated and acquiring the flu. Given the patient demographics and educational attainment of many of the participants of this study, it can be speculated that educational and economic levels may be a barrier to patients not receiving the vaccine. This information is vital because it not only provides insight into possible barriers for influenza vaccination, but also demonstrates a potential opportunity for pharmacists, and other healthcare professionals to develop strategies that specifically target individuals from specific economic and educational levels. Active dialogue from healthcare professionals can contribute to increasing influenza vaccination rates. 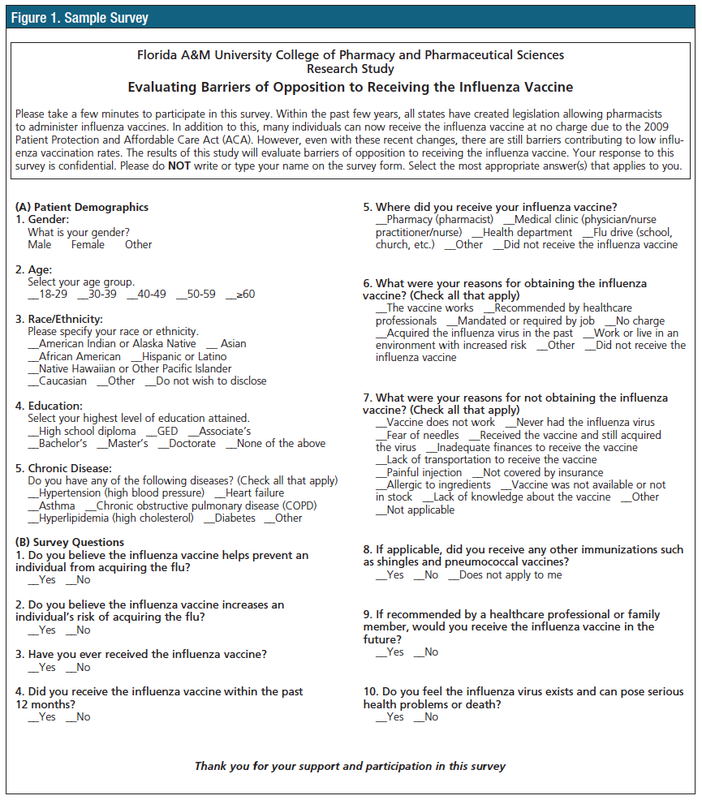 Often, information advocating for influenza vaccination is provided to patients in the form of newsletters and brochures. However, in most cases, the information is never explained because of time constraints, leaving the patient confused and not actively engaged in their own health. Approximately 71% of the study participants reported that they would get the vaccine if it were recommended by a healthcare professional. These findings are congruent with previous data reported by the CDC during the 2013-2014 season, and suggest that individuals trust their healthcare professionals and will listen to their recommendations. Media campaigns using television and radio can positively impact influenza vaccination rates as well as social media websites such as Facebook and Twitter. These campaigns should advocate for vaccination and also provide information on possible consequences of not acquiring the vaccine. Lastly, the data showed the need to develop and implement vaccination teams that target minority communities and other reported areas with low influenza vaccination rates. These teams should consist of various healthcare professionals (eg, nurses, physicians, pharmacists), civic leaders, and religious leaders from within these communities who understand and can relate to people in the community. These teams should also provide education and information on where to receive the vaccine. Follow-up visits and phone calls should be completed to ensure individuals have every opportunity to become vaccinated. As with anything else, data should be collected and analyzed to determine and address areas of success and needs for improvement for best practices. Healthcare professionals, such as pharmacists, have the opportunity to administer vaccinations and educate individuals about the influenza virus and vaccine. However, because of increased workloads and reduced staff, their ability to engage patients in dialogues about influenza vaccinations has been diminished. Healthcare professionals should always be on the front line, creating active dialogues and advocating for influenza vaccination. This fosters an environment for healthcare professionals to educate individuals regarding the seriousness of the virus, and eliminate any myths or misconceptions. In addition, media campaigns and vaccination teams can help reach underserved populations, as well as patients who may not be in contact with a healthcare professional (eg, a physician or pharmacist). Although influenza vaccination rates have improved, there is still much work that needs to be done to reach the goal of 80% vaccination rate by 2020. This study was presented at the American So­ciety of Health-System Pharmacists 2014 Midyear Clinical Meeting and Exhibition; December 7-11, 2014; Anaheim, CA. Hoyert DL, Xu J. Deaths: preliminary data for 2011. Natl Vital Stat Rep. 2012;61:1-51. Reed C, Kim IK, Singleton JA, et al. Estimated influenza illnesses and hospitalizations averted by vaccination—United States, 2013-14 influenza season. MMWR Morb Mortal Wkly Rep. 2014;63:1151-1154. Simeonsson K, Summers-Bean C, Connolly A. Influenza vaccination of healthcare workers: institutional strategies for improving rates. N C Med J. 2004;65:323-329. Grohskopf LA, Olsen SJ, Sokolow LZ, et al. Prevention and control of seasonal influenza with vaccines: recommendations of the Advisory Committee on Immunization Practices (ACIP)—United States, 2014-15 influenza season. MMWR Morb Mortal Wkly Rep. 2014;63:691-697. US Department of Health & Human Services. Immunization and infectious diseases. www.healthypeople.gov/2020/topics-objectives/topic/immunization-and-infectious-diseases/objectives?topicId=23. Updated August 31, 2015. Accessed August 31, 2015. Traynor K. With Maine on board, pharmacists in all 50 states can vaccinate. www.ashp.org/menu/News/PharmacyNews/NewsArticle.aspx?id=3199. Published November 1, 2009. Accessed August 31, 2015. Rothholz MC; American Pharmacists Association. Pharmacists as partners in adult vaccinations. www.ct.gov/dph/lib/dph/infectious_diseases/immunization/naicp/pharmacists_and_adult_immunizations_final.pdf. Published August 2011. Accessed August 31, 2015. Zimmerman RK, Santibanez TA, Janosky JE, et al. What affects influenza vaccination rates among older patients? An analysis from inner-city, suburban, rural, and Veterans Affairs practices. Am J Med. 2003;114:31-38. Flowers L, Sinclair SA. Racial and ethnic disparities in influenza and pneumococcal immunization rates among Medicare beneficiaries. http://assets.aarp.org/rgcenter/health/ib83_disparities.pdf. Published 2007. Accessed August 31, 2015. Centers for Disease Control and Prevention. What is health literacy? www.cdc.gov/healthliteracy/learn/. Accessed October 27, 2015. Kutner M, Greenberg E, Jin Y, et al. The health literacy of America’s adults: results from the 2003 National Assessment of Adult Literacy. http://nces.ed.gov/pubs2006/2006483.pdf. Published September 6, 2006. Accessed August 31, 2015. Influenza Vaccinations: Which Vaccine Is Best for Your Patient?